If you want your site to rank well on Google, it’s critically important that you lay the proper SEO foundation. That starts with what’s known as Technical SEO for how Google crawls your site, and what it finds. And then it goes all the way up to the hidden tags in your content that you and your readers never see, but Google certainly does. It’s not like Google makes SEO easy to understand or implement. And most SEO posts are only about ranking, which is raising the roof before laying the foundation. That just won’t cut it in 2018. Stop Doing Your SEO Like It’s 2013! 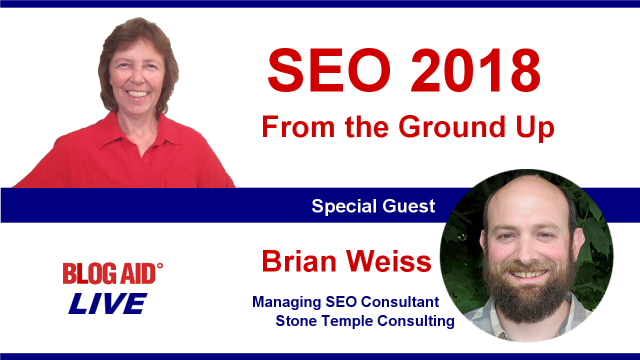 To help you get up to speed quickly, and dispel old SEO notions, I’m delighted to interview Brian Weiss, who is a Managing SEO Consultant for the premier SEO agency, Stone Temple Consulting. Believe it or not, 90% of those topics are considered Technical SEO. And they are the very foundation of SEO on your site. You can and should do these SEO tasks yourself. And it’s easy, once you know what to do and how to do it. That’s what my DIY SEO course and workshops are all about. Brian Weiss is a managing consultant at Stone Temple as well as a columnist at Search Engine Land. Brian has a decade of experience helping businesses of all sizes with their SEO – everything from local service businesses to Fortune 500 companies. He is a featured speaker on the Advanced Technical SEO panel at SMX West in San Jose, March 2018.